All these services are in constant communication with the Realtor, not necessarily with each other but always with the Realtor. The process is long, constant, tedious, and often times challenging. The moment things go wrong everyone calls the Realtor, everyone looks to the Realtor to fix the problems and often times by “kicking in” more commission. In the negotiations when buyer and seller are thousands apart nobody says let’s call the lender, the surveyor, the HVAC guy, and everyone else involved to see who all can give. They would be laughed out of the room but somehow the Realtor’s commission is part of the fees being negotiated. And it always seems that the deals where the Realtor negotiates their commission are the deals where one party is not appreciative at all and just expect more and more. 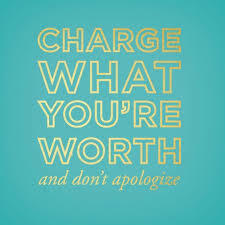 Turning over a new leaf – Charging what I’m worth and I’m not gonna apologize. If someone can’t appreciate my value then I need to save that space in my schedule for ones who do. Appreciative clients are out there and those are the ones I choose to do business with! There’s no more room on my calendar for people who think “What’s mine is mine and what’s yours is negotiable”! end of vent . . .